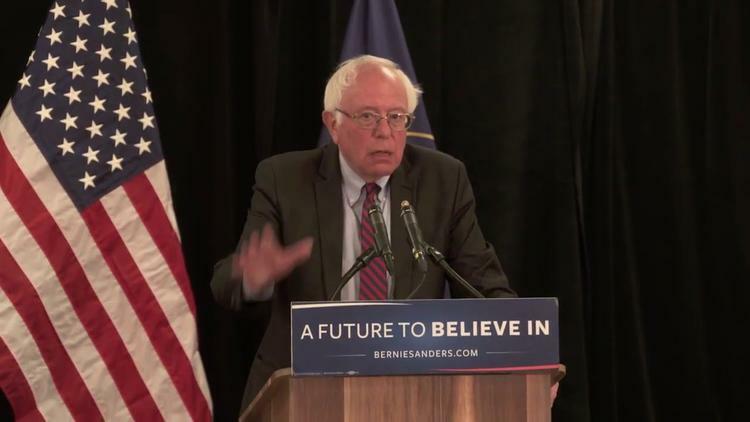 Are Sanders' Criticisms of Israeli Occupation Policies unprecedented in Presidential Campaign? Bernie Sanders is being attacked for comments on the Middle East in his interview with the editorial board of The New York Daily News, but all he did was restate current US government policy. What is remarkable is that Sanders dared just, like, criticize Israeli policy toward the Palestinians as involving illegal squatter settlements and disproportionate use of force. Everyone knows these things, but I can’t recall another presidential candidate who said them outright during a campaign. This is because although they are a small minority, Jewish Americans form a swing vote in some key states like Florida, and they are unusually generous in donating to political campaigns. And politicians assume that Jewish Americans are looking for unvarnished praise of Israel. But while arch-conservative pro-Israel lobbies like AIPAC may never want to hear a discouraging word, Jewish Americans (most of them political liberals and leftists) are deeply divided on the far-right Likud government of PM Binyamin Netanyahu, and Sen. Sanders is well aware of this. Besides, his crowd-sourced funding model means he does not need the donations of billionaire American Likudniks. You have to wonder whether Sanders is not making a historic breakthrough in American discourse on Israeli policy. It is just a few inches to the left, but it is unprecedented in a mainstream presidential campaign (and he still had to recite the mantra of Israel’s right to exist and point out that he has family there– as if those were relevant to the main issue of Occupation). 1. ISIL must be defeated, and defeated primarily by Muslim powers in the region without involving the US in a land war. (This is more or less President Obama’s position, contrasting with the positions of Sec. Clinton, Sen. Cruz and of Trump on every other day). 2. Hamas is a terrorist organization that uses indiscriminate force in its rocket attacks on Israel. 3. Hizbullah in Lebanon is a terrorist organization. (That is the US State Department position). 5. Israel’s assaults on trapped little Gaza have involved unacceptably high civilian casualties. He said he didn’t remember the number in the last attack on Gaza but thought it might be as high as 10,000. He is being attacked for this number, but he said specifically he didn’t remember the number, so obviously he meant to say the casualties were in the thousands. An editor looked it up on his smartphone and corrected it to 2,400. Sen. Sanders did not demur. Israel’s Operation Protective Edge against Gaza probably killed 2,191 Palestinians, and the vast majority of them were civilians. Indeed, about 400 appear to have been children. Israel’s 2008-9 Operation Cast Lead against Gaza killed around 1400, again mostly civilians. But the Israeli peace organization B’Tselem estimates that from the year 2000 until just before the last Gaza assault, Israel had killed nearly 10,000 Palestinians [9,271], so that may be why that number stuck in Sen. Sanders mind. So the total since 2000 is over 11,000, though not all of those were non-combatants. A ‘Combatant’ is anyway hard to define in conditions of foreign military occupation — are 8 year olds throwing stones combatants? By the way, just in the years 2000-2008, the Palestinian Red Crescent counted 33,000 Palestinians wounded, so the issue of disproportionate force extends beyond just deaths. And, of the over 11,000 Palestinians killed, about 2,000 were children. In the same period, B’Tselem says that 1217 Israelis were killed by Palestinians (one would have to add a few dozen more, all soldiers save for 6, during the invasion of Gaza). Thus, since 2000 Israelis have typically killed about 10 Palestinians for every Israeli killed if we accept the B’Tselem count, which may undercount Palestinian deaths according to the Palestinian Red Crescent. So Sen. Sanders’ point is correct about disproportionate force. He he himself was not giving an exact casualty count. Nothing he said was actually controversial or departed in any way from the current positions of the US government.